Instantly download these 2 inch printable Fortnite V-Bucks Cupcake Toppers. A super easy way to dress up cupcakes for a Fortnite birthday party! Also use these as small Gift Tags (see thumbnail). 1 x PDF file with 12 x 2 inch cupcake toppers per page. 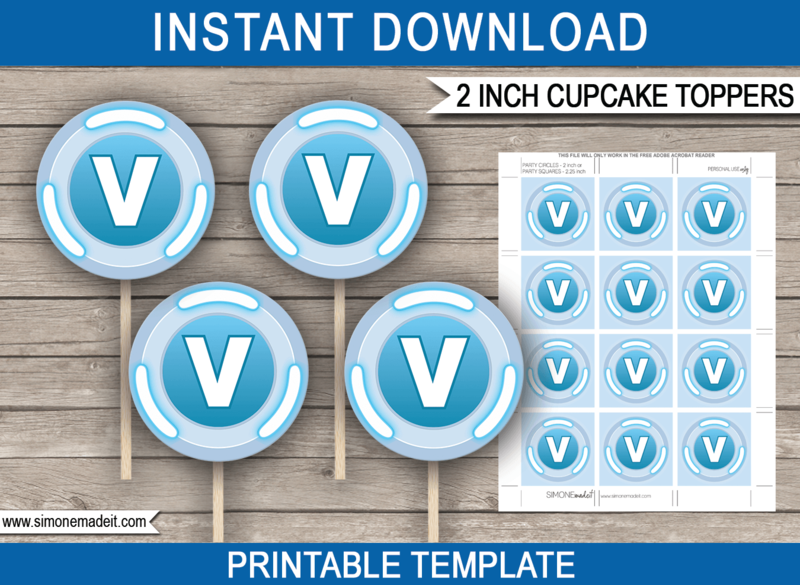 Download your printable Fortnite V-Bucks Cupcake Toppers template immediately after your payment has been processed. After printing you will need to either punch the Fortnite V-Bucks Cupcake Toppers out with a 2 inch circular hole-punch for Circular Toppers; OR cut them out with scissors and use as 2¼ inch Square Toppers.